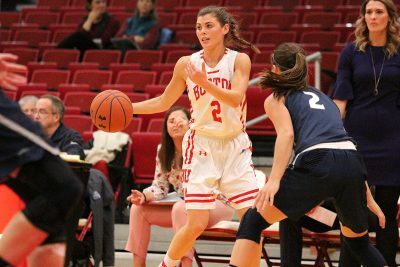 The Boston University women’s basketball team picked up the program’s first-ever win at the United States Naval Academy Saturday, beating the Mids 49-35 with a dominant second-half performance. BU (9-9, 5-3 Patriot League) head coach Marisa Moseley said she was proud of her team for battling through a tough start to the game. The Terriers committed five turnovers in what was a sloppy first quarter, but those went unpunished as Navy (8-10, 3-5 Patriot League) went 3-for-19 from the field. In the second quarter the Terriers took their first lead of the game 9-8, off a layup by freshman forward Ashley Sieper. However, the Mids answered with a three to retake the lead. Going into the half, Navy held a 16-13 lead over the Terriers. Mids guard Jennifer Coleman led all scorers at the half with six points, while Terrier sophomore guard Katie Nelson led BU with five. In the first half, the Terriers were an ice-cold 0-for-7 from three, while the Mids shot only 2-for-9 from beyond the arc. Both teams shot under 25 percent from the field. Moseley said she issued a challenge to the team at halftime. “I just challenged them — we’re a better team than that, we need to be more disciplined… we needed to focus in and finish,” Moseley said. BU’s second half started much cleaner than the first, as they drained their first five shots to go 25-15 up six minutes into the third frame. The Terriers continued drilling shots, going on a 12-0 run fueled by Navy’s five turnovers in the same span. The Mids ended the scoring drought with a three-pointer by guard Kolbi Green. After a lengthy video review with 14 seconds to go in the quarter, a foul was given to the Terriers and Nelson nailed both free throws. BU would outcome Navy 21-4 in the third, racking up a 34-20 lead. In the final quarter, BU’s offense did not slow down as the Terriers jumped out to a 38-25 advantage in the first three minutes. By the final buzzer, that lead had increased to 14 for a final score of 49-35. The Terriers pressured Navy throughout the game, forcing 19 turnovers. BU shot 64 percent from the field in the second half, compared to 24 percent in the first. Nelson led all scorers with a season-high 23 points, while Coleman led the Mids with 10 points. BU will stay on the road to close out January, traveling to Easton, Pennsylvania, to continue conference play against Lafayette College (7-12, 2-6 Patriot League). The Leopards have won one out of their last six games. Moseley said her team needs to be prepared for the Leopard’s defense on Jan. 30.